[XPB-6XX5XX] Box Storage lockers are constructed of 16 guage steel and finished in a durable powder coating in choice of Gray or Tan finish (see Color Selects). 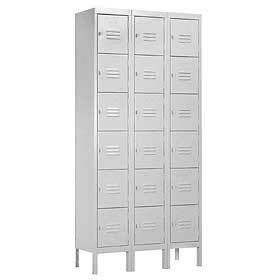 Steel Metal Box style lockers are available in 5 Tiers (5 Ft.) and 6 Tiers (6 Ft.) Heights (add 6" for legs). Choice of Single Wide and Triple Wide units, offered in 12", 15" and 18" Depths (see Height/Unit/Depth Selects) and delivered Assembled or Unassembled. Each individual locker storage area is 12" W and 12" H and compartments includes a door with strong steel hasp. Built-in locks (XPB-77710 for combination and XPB-77715 for key), padlocks (XPB-77720 for combination and XPB-77725 for key), end bases, front bases and sloping hoods are sold separtely. For shipping quotes, orders or questions please call our Customer Service Center at 1-877-483-9270.